Photo by Axel Marcenaro: De’Anira Moore, junior, fights past her defenders for a successful layup. Moore scored 19 points against Tarleton. The ASU women’s basketball team defeated Tarleton State University on Jan. 31 and Texas A&M Commerce on Jan. 2. In Thursday’s game, the Belles won 63-60 to move their overall record to 15-2 and their Lone Star Conference record to 10-1. Sophomore De’Anira Moore led ASU with 19 points and nine rebounds. Senior Marquita Daniels finished in double figures, as well, with 16 points, six rebounds, five assists and two steals. Senior Maria Delgado was the third ASU player in double figures. She had 11 points with three successful 3-pointers. Junior Dezirae Hampton led the game with 14 rebounds. Junior Mikayla Blount joined her with six rebounds. The Belles and TexAnns went back and forth throughout the game, but it came down to the end. In the final seconds, Daniels stole a pass and came back to the hoop for a layup, then Hampton blocked Tarleton’s final shot as the game ended. In Saturday’s game, ASU won 84-70 to move their record up with another win. 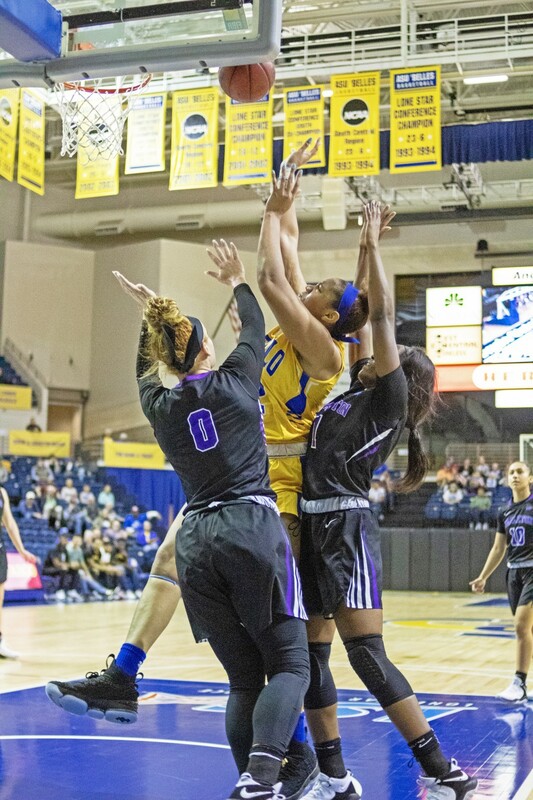 Eastern New Mexico University defeated Midwestern State, as well, which gave the Belles a two-game lead in the conference standings with only eight games left. Daniels led the Belles in this game with 22 points, four assists, two rebounds and a steal on 9-12 shooting from the field and 3-4 in the three-point range. Junior Essence Johnson and Delgado finished in double figures, as well. Johnson shot 8-11 from the field and had 17 points with eight rebounds. Delgado ended with 13 points, seven rebounds and four assists. Moore, Blount and junior Catara Samuel were crucial for the Belles, as well. Moore had eight points and rebounds, Blount had seven points and five rebounds and Samuels finished with eight points and three rebounds. The Belles trailed at the beginning of the game, but then went on a 12-0 run to get the lead and never let their opponents have it again. ASU shot 52 percent from the field and 47 percent from the three-point line while holding Commerce to 36 percent shooting and 29 from the three-point line. The Belles will be back in the Junell Center on Feb. 21 and Feb. 23 to face Western New Mexico University and UT Permian Basin.